Forum » Vehicles » Your Rig! » Big Tuna's "Building the Dub!" Re: Big Tuna's "Building the Dub!" From here, I shaved the grille "mounting bracket" off of the back of the cover with the rotary tool. I then trimmed the flat back of the grille (the part of it that makes contact with the cover) down so that it only has 3 small points where it is glued to the cover. This allows for maximum room for the surround of the 3.5's to flex and move without hitting it. So far it sounds great again, and doesn't look much different from stock, except that the dash speaker grilles are a little bit higher up than before. Last week I bought an eraser wheel tool and removed the paint pinstripe from the body of the dub. It rubs it right off like it was nothing at all, and doesn't damage the clear coat. Its all a part of the "degrampafication," a small series of visual changes I'm making while I save up for a lift and tires. I also made some adjustments to the grille again, as the duplicolor clear coat is a waste of money. I ended up buying a can of rust-oleum clear enamel, and it fixed that problem real quick. I also ended up spraying the black sub-grille with bed liner, and that looks MUCH better. In just the few weeks since I had painted it, the paint had faded. Reading about your tweeters reminds me, I have replaced mine with Pioneers since the factories were blown when I bought it. They work fine but I really dont seem to get very good highs out of them. Are you happy with yours? And btw, completely agree with the Polks. Some of the best sounding speakers ive used. The Fosgate 3.5s sound fantastic, but you do have to use the rotary tool a little bit. These have an INCREDIBLE high range, and an extremely good midrange. Even with very little securing these in, they vibrate the dash quite a bit. I had a pair of boss tweeters up there before, but these sound MUCH better. So, I got to head up to Flagstaff this weekend to be a voulenteer at Overland Expo 2014. It was riddled with mechanical issues, but I still had fun being up there and chilling at the expo. I drove home without a clutch fan, limping the old girl back home in 100 degree weather with the heater on full and the windows down. 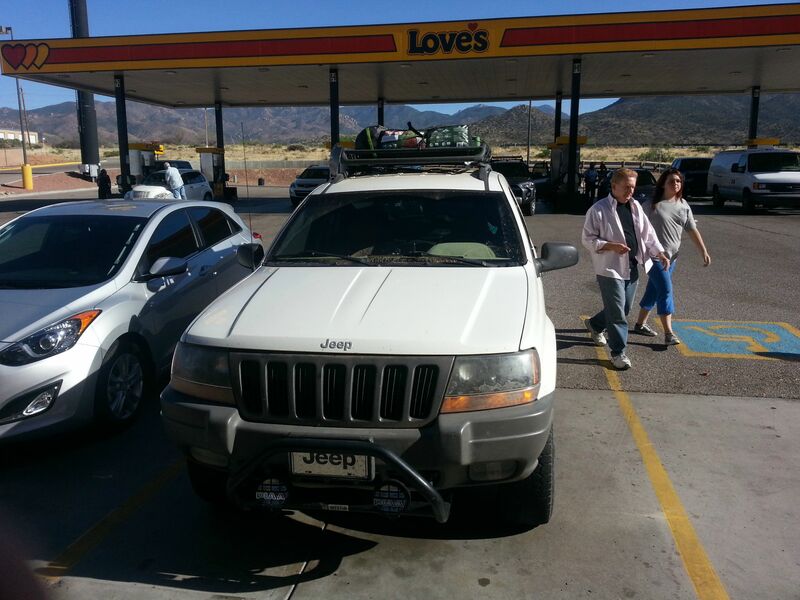 Thanks to our good friend Jeff, I now also have a roof rack, which de-cluttered the Jeep for the trip back! Last edited by BigTuna117; 09-12-2014 at 05:28 PM. Well, the fan clutch and the alternator have been replaced. Sometimes it's the little things that make a difference. Up next will be diff fluid, and a new thermostat. don't ya hate spending money on things that aren't upgrades? Yeah. The alternator kind of caught me by surprise. I knew My battery was low, but the reason became apparent when I popped the hood to find thick smoke pouring out of the damn thing. While the Jeep sat waiting for the new alternator, the thermostat started leaking. But, I knew this day would come. Another problem I'm facing is the A/C is starting to leak at an alarming rate, and I am still trying to hunt down the leak. The good news is, other than that, the engine/ trans/ transfer case are all healthy, so I can't complain too much. a few months ago the rubber part of the top hose going to my A/C compressor had a pinhole leak. there's a corrugated sheath around it so it took me forever to find it, but once i removed that sheath i found a nice puddle of the leak detection dye inside it! Well, I'll have to take a look there. Thanks for the tip!